I recently wrote about the horse conch and it’s impressive size, but the West Indian Chank shell can be very large as well, up to 14 inches long. 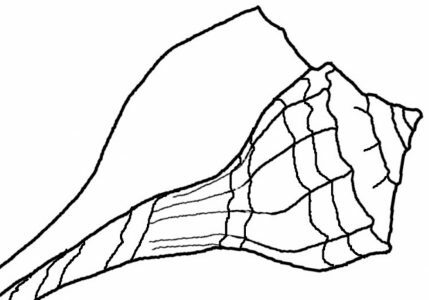 It is shaped similarly to the horse conch but is a thick, heavy shell that is yellowish brown in color and begins at the tip being narrow and then flares out with widely spaced “ribs” in the middle. The opening is long and wide. At first, as I researched info for this post, I thought it was used in Hindu ceremonies, but I’ve found that it is another chank conch which has a different shape but is also quite large. The Shankha (turbinella pyrum) is an Indian word which means “divine conch” and may be known as the “sacred chank”. Found in the Indian ocean, it is commonly a left-handed shell (like the lightning whelk) It is rare to find a right-handed one, so of course they are sought after for use in the hindu ceremonies where they are used as ceremonial trumpets. This shell has been given names according to the side of the opening. The more common, left handed ones are Vamavarti and the rare, right-handed are named Dakshinavarti. 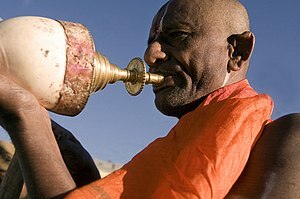 The American Museum of Natural History has a picture of a chank shell – or more likely a shankha shell -that was used to make a trumpet (photo) for use in Buddhism in Tibet as part of religious rituals. The shell is part of the bronze and copper trumpet, and although you can’t see the opening of the shell in the photo, the description says that this particular shell spirals to the left. It is ornately carved and includes gems and even a matching box, that is also carved and was used to “give the instrument a deeper and more resonant sound”. The shankha is always depicted in the upper left hand of the 4-armed Hindu God, Vishnu. Also view carved Shankha shells at Wikipedia.